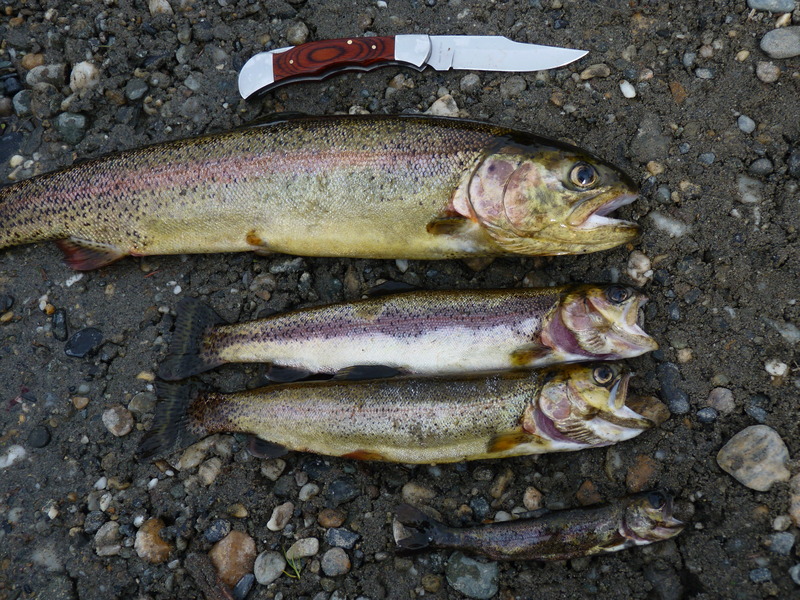 Motrout has attached these 6 pictures to this report. The message is below. 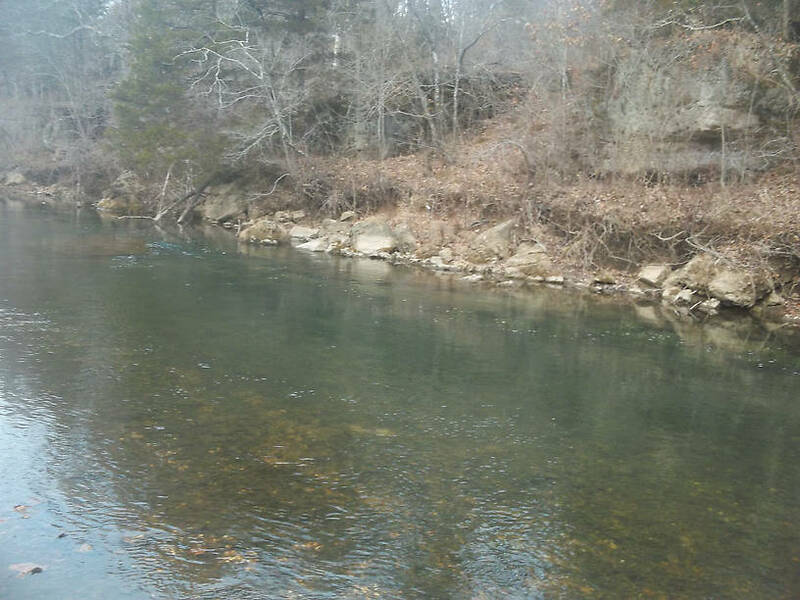 Not a great quality pic, but the possibility of finding a big brown in this pool has crossed the mind of more than one angler. I know its full of rainbows. 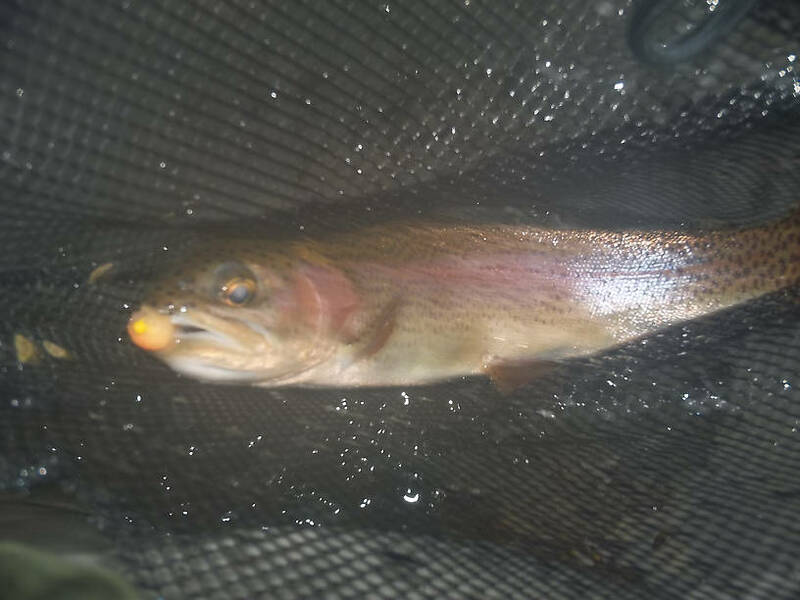 A typical rainbow from the Current River caught on an egg pattern from the pool shown above. 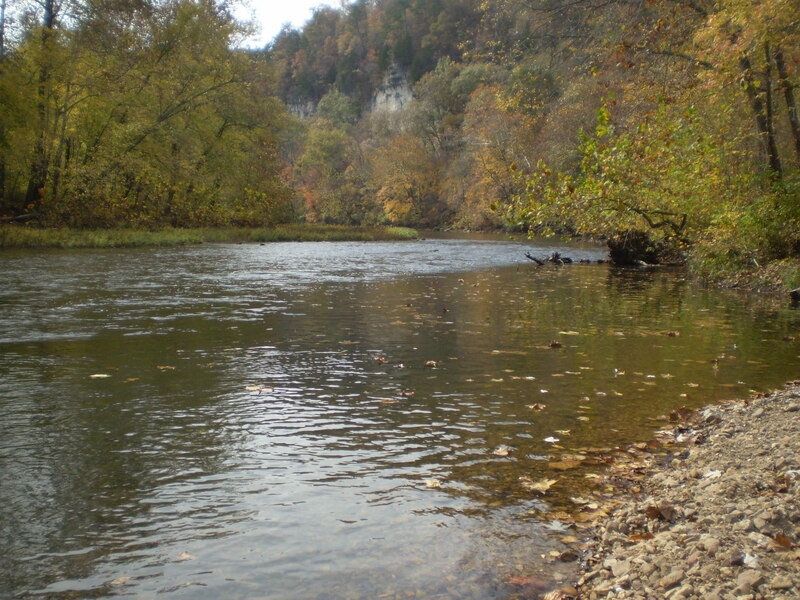 A nice riffle on the Current River. It's usually good for a rainbow or two, and the beautiful, pine covered hill that rises above it makes it an ideal place to wet a line . This brush lined pool always looks great, but seems to have a rather high chub:trout ratio. In this stretch, the Current looks very much like the oversized spring creek that it is. Conditions & Hatches First night.....upper 20s, mostly cloudy, very little hatching. Morning of the 31st....started off very cold (low teens) but rising quickly and dramatically to around 50 with some midges later on. 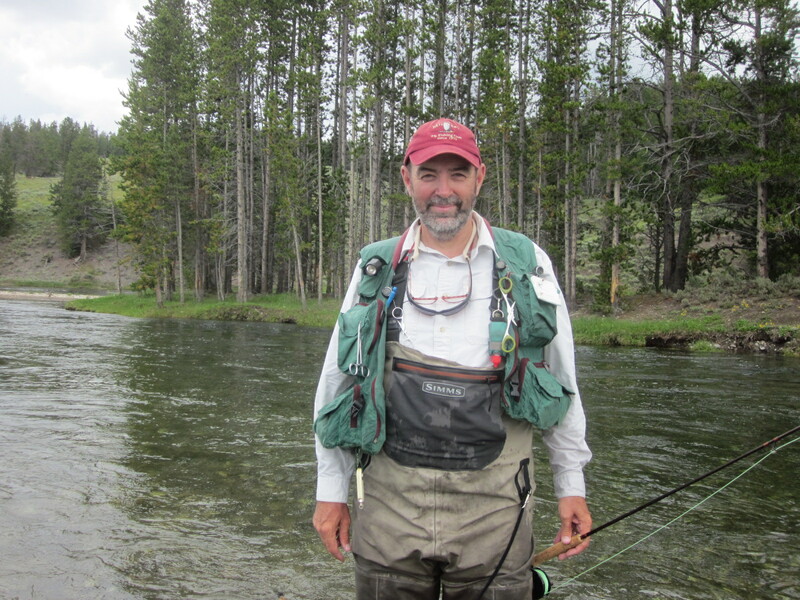 Fishing improved with warming temps. Didn't take the water temp but it would almost certainly be in the mid/upper 50s. Posts: 319 First off, sorry for the belated report, but life has been reasonably busy and better late than never. 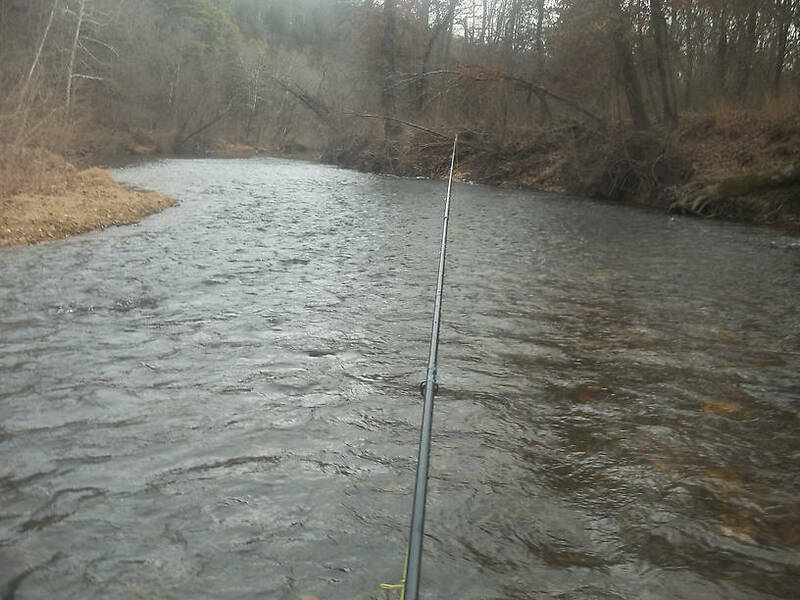 I made it to the upper Current about 1 PM on December 30th with the hope of finding a secluded river and maybe a few trout. 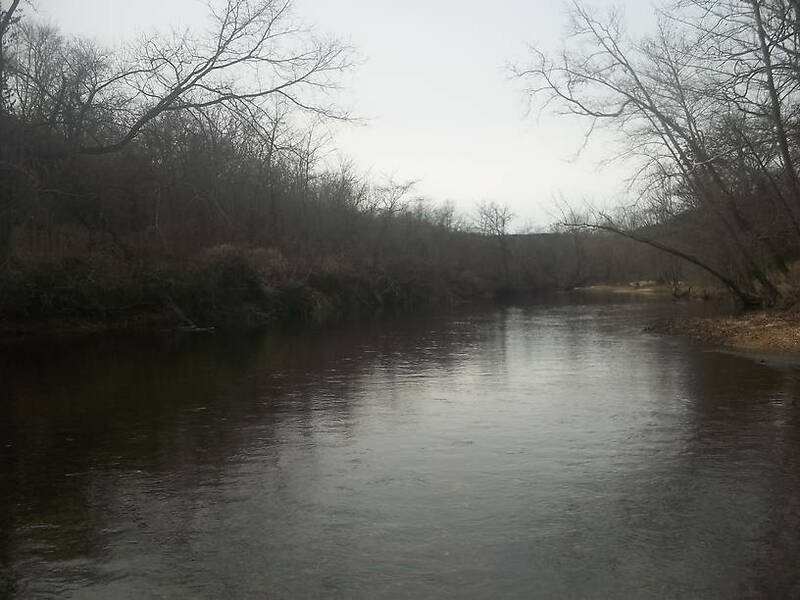 We drove to a remote access/campsite well downstream of the manicured, heavily stocked waters of Montauk State Park. 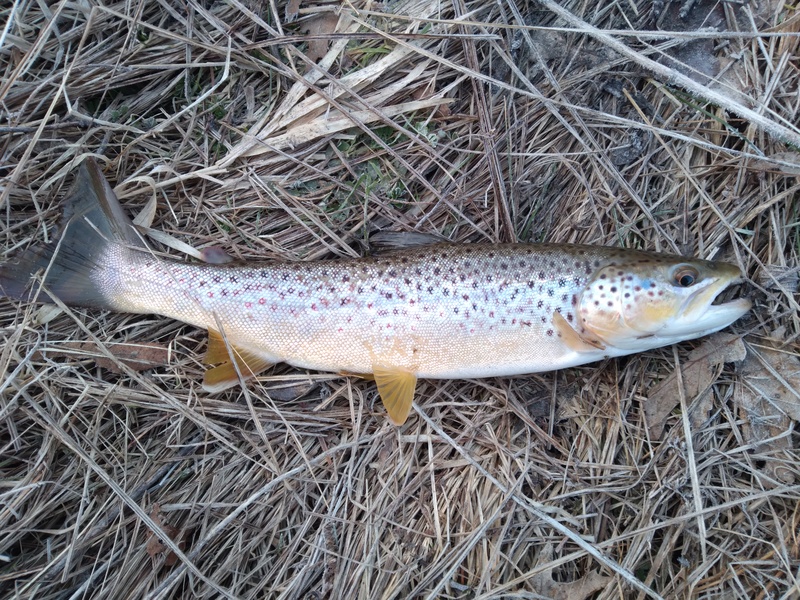 No one was there, which meant more productive trout water than we could properly handle in a couple of days. It may not be good form to some, but egg patterns (or glo-bugs if you like) often work very well on the Current, and I have little hesitancy to use them. That was the case that afternoon. I started working a deep, rocky pool just below camp, and it was as productive as it looked. I've often tried to coax big browns out of this pool, but today I was just happy with the smaller rainbows. After I wore out my welcome on that pools residents, I moved down to the nearby riffles with pretty good results as well. That night was pretty cold. I was able to stay reasonably comfortable, but the tent was fully covered in ice when I awoke. I warmed up in the truck for a bit before I worked up the courage to get back into the river. The fishing wasn't as good in the bright sunlight (it had been cloudy the previous day) but it wasn't bad either. 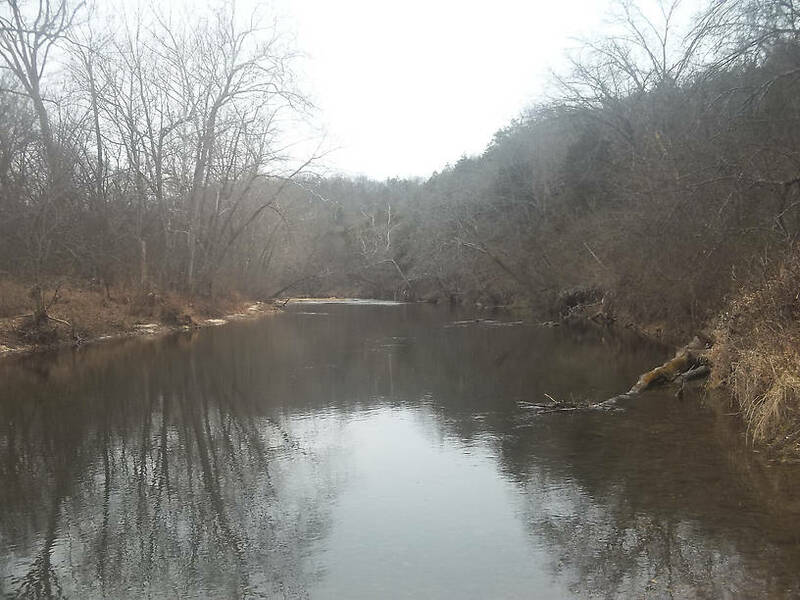 Overall, the river was about as peaceful as a Missouri trout stream can be and there is just something special about cold weather camps. Anyway, good job! I won't make any disparaging remarks about Glo-Bugs whatsoever, if you can catch trout on them in December then more power to ya! 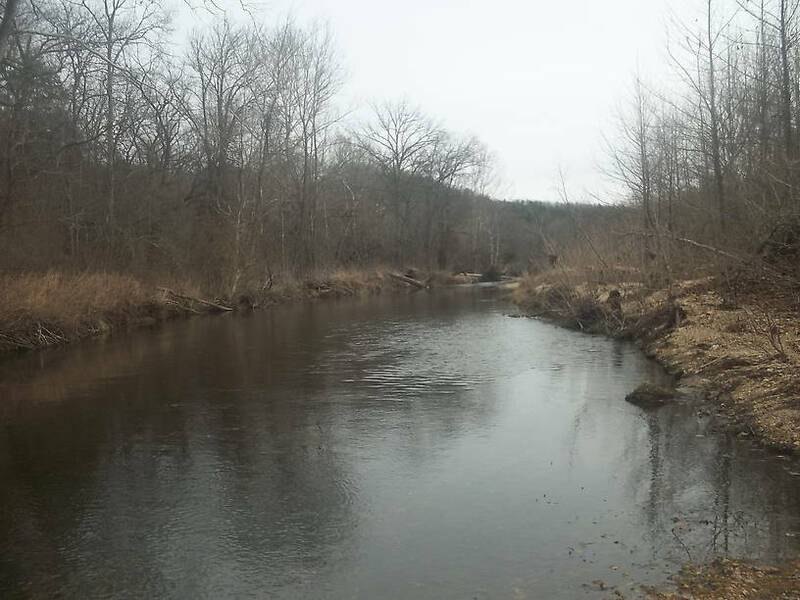 And if I remember correctly, Missouri spring waters average around 57 F.
Posts: 319 The spring-fed streams are awfully nice to have during the wintertime. This stream fishes very well on dries in the spring and fall but winter is globug time. Except when the midge hatches are going on the warmer days. It was good to get out when I did. Right now the temperature is below zero with about 10 inches of snow on the ground. The fish might still be catchable on the spring water, but I'm not brave enough to try. It may not be good form to some, but egg patterns (or glo-bugs if you like) often work very well on the Current, and I have little hesitancy to use them. During the previous two days I had been mesmerized by an all day hatch of the ubiquitous Midge. The fish were lined up along the slow water, tight to the bank, eagerly taking any dry presented in the 22 to 24 size range. But today the hatch had been cancelled; evidently I hadn�t paid sufficient homage for my previous success. No, today the cap on the aquatic world had been sealed, what had once been rife with excitement was now depressingly void. So, I reluctantly decided to nymph my way up into the Red Gorge, trying some of the more turbulent water. As I slowly advanced my offense, working up river, it became increasingly evident that my tactics were lacking. It was fast approaching the noon hour, and all effort to this point was of no avail. I began frantically searching the deepest recesses of my mind, trying to coerce from memory that perfect combination of imitation and presentation, that would pique the pea brained Pisces to pick-up. It was then, while I was going through one of my many fly boxes, I think for the second time, that I noticed an old salmon egg imitation, buried at the bottom of a mass of tangled flies. I hadn�t seen it in years. Many years ago, as a neophyte, I had used this despicable thing. It was on a private stretch of the Frying Pan from which I had wretched a twenty-seven inch Rainbow, my biggest fish to date. When I say �wretched� what I mean to say is; can you imagine catching the fish of a lifetime on a salmon egg imitation? It kind of takes the wind out of your sail doesn�t it? Well anyway, I thought I�d eliminated all trace of this incriminating evidence long ago. My worst fear was that one of my fishing buddies would spot this in my box; I may as well have been carrying a jar of the real stuff. Surely I would have been shunned, if not down right banished, by my fellow elitists. I grabbed my forceps and deftly plucked it from its place, reveling in the sweet-sour memory it produced. It was at that very instant that it suddenly hit me. Now at this point some of the more astute fly fishers might be thinking, that I was thinking, of trying this salmon egg. I can assure you that I would never stoop that low. Can you imagine how I would feel if I caught an even bigger fish on the damn thing? So no, no insanity, no REDRUM, no blood pouring out of elevators...but some freakin' cold SH*T, I like winter and am an avid X/C skier and ice fisher but this is PAINFUL. Consolation? With all the snow we have had I'll have plenty of time to ski on it AND we'll have a great morel crop in the spring! Posts: 212 Motrout, Nice photos. it would be fun to do some winter fly fishing. Not an option usually here in Alaska where I live. C'mon, below zero? That is not all that bad...:) On Christmas Eve I went ice fishing without a hut at -30F. Bad idea. I was fine, but my one buddy got frostbite on his toes. The other one was fine also. I didn't fell sorry for him. He wanted to go ice fishing and also he wanted to experience -30 to -40F. He ended up experiencing -48F while he was up visiting, much to the consternation of us residence. I am not complaining though. it has been a balmy 20-28F above this whole week and no wind. I forgot to tell you I drove over to Willow Run last Saturday. I did the Winter Bird Count at Kent Lake and decided to head down to Ypsi because they had spotted some Snowy Owls down there. They said there were three, but I saw just one. Wow! What a bird. I was looking at him through the binocs and he was starring right back at me with yellow eyes. I haven't seen one since 1990...in downtown Detroit in the middle of the night. One of my oddest ever sightings. Posts: 797 WoW Spence lucky you. I got to know a screech owl name " One eyed Jack ". 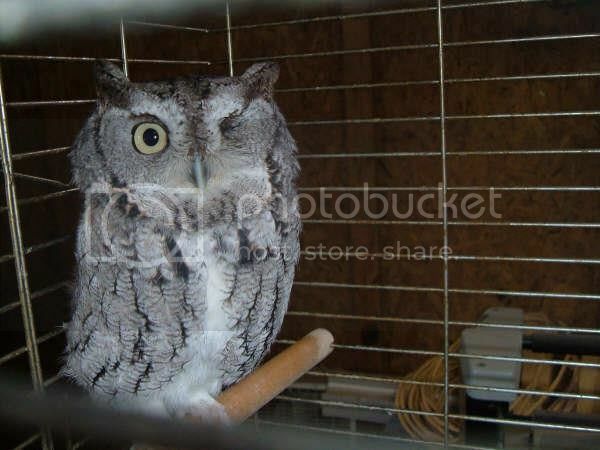 My brother and his wife ran a rehab center for wildlife and Jack the owl was found injured by having lost one eye. He lived for many years at the farm and me and my brother filmed him as he passed on in my brothers hands. I remember him looking up at us to say it OK guys thank you for everything you have done for me and then went to sleep forever that was a very defining moment for us both. I still have tears to think of him and that moment in time. here is a picture of him I miss you buddy. Motrout, Nice photos. it would be fun to do some winter fly fishing. Not an option usually here in Alaska where I live. I know -5 (which was about our lower limit here) isn't all that cold and I expect no sympathy from you all who have to deal with this stuff (and in your case, far, far colder) on a regular basis! Besides, I actually rather enjoyed it. I was lucky to be able to take a long hike on the coldest day, because the opportunities to be out in that kind of weather do not come often. It was quite beautiful. That is wrong! :) There you all are down there seeing snowy owls! I haven't seen one of those things for years! They are amazing birds. I have wanted to do the Christmas Bird Count, but I never got around to it. The bird highlight for the winter was yesterday. We had a large flock of Bohemian waxwings in the crab apple tree. I love those birds, but it is really hard to get close enough for a photo. Motrout, I won't flaunt my "Alaska resident" card to much here. :) For me -5 is about my cut-off for most outdoor activities. Once it gets below that, everyone needs to be more careful about what clothing they wear, exposure, etc. My favorite temperature for most things winter things is about 15 to 25F. I can agree with that. I am very hesitant to wade fish when the temperatures are around zero. 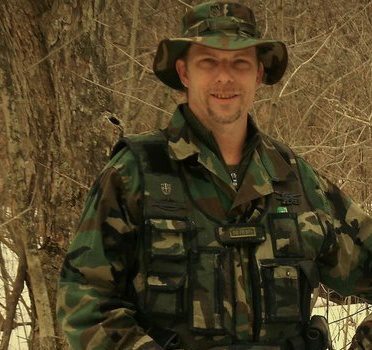 Waders just spring a leak too often, and besides, ice in the guides makes it about unworkable. Ten degrees is about my cut off. ice in the guides makes it about unworkable..
Ahhhh! Alaska...gotta' love it or gotta' hate it...:) I love it!! I took a photo workshop yesterday at the Michigan Audubon and we had a couple model birds there from a re-hab center to practise on. They had a Barred Owl there missing an eye as well. Owls aren't able to move their eyes around in their sockets and once they lock on a prey they forget everything else and cross the road without looking both ways and get hit by autos a great deal. On our winter bird count we found a perfect outline in the snow of a Screech that had probably nabbed a mouse. You could see the head and ear tufts, the tail feathers, and finger like markings in the snow from its primaries...Pretty cool! Our models yesterday were a Red-tailed Hawk, a Harris Hawk, the Barred, and a Great-horned Owl. The Harris isn't native here but was used by some Falconers and its left wing was damaged somehow and the clinic took it in. Yes. We are having what they call an "irruption year" with the Snowy Owl. For some reason these birds head down this way every so often, way outside their natural range. They love some of the larger wide open areas where there are miles of farm fields, and seem to love to hang around airports. Windsor airport across the river here in Ontario Canada had to round them up, band them, and drive them 50-60 miles away from the airport. There were three at Willow Run airport here, but I only saw one. The reasons for the irruption are guessed at. You have a few milder winters in a row and you have a good survival rate of young birds and there quickly becomes a territorial problem. Food sources seem to be cyclical and when these rodent population fall, the birds head out looking for food. In the books they say that its usually the males that roam, but the one I saw was rather large. It is a bit odd seeing them here. The one I saw in 1990 was in downtown Detroit! The Willow Run Airport is where Ford built airplanes during WWII. Not pristine viewing areas. Out by the airport are trucking docks etc and some of the rare bird posters have reported seeing them standing near these trucks and planes...They look more natural, I'd guess, up where they are normally found. Up your way. How is your winter going. I think Jack was also hit by a car. His beak was also messed up and every other month we had to file it so he could eat his dead mice. Re: Spring is around the corner!